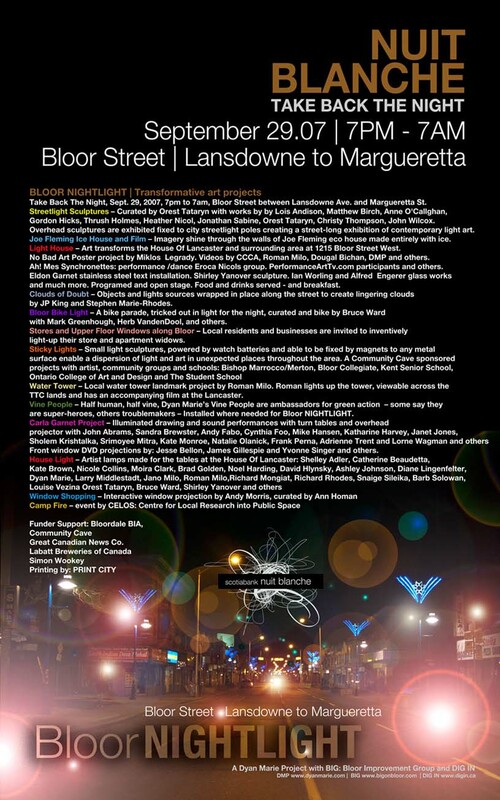 Bloor NIGHTLIGHT, a festival of lights along Bloor Street from Margueretta to Lansdowne unleashes a dynamic series of artworks that work to vitalize this at-risk area for Nuit Blanche. BIG: Bloor Improvement Group, with initiating artist and curator Dyan Marie, and dozens of contributing artists, offer “BLOOR NIGHTLIGHT“ an event that will involve wide local support and participation. The 2 block-area BLOOR NIGHTLIGHT location between Lansdowne Ave and Margueretta Street is best known for its negative press coverage: 94 crack dealers charged in one month, toxic lands, struggling and vacant storefronts. Bloor Nightlight intends to be a catalyst. It is a Nuit Blanch project to take back the night and engage the neighbourhood. A related Better Bloor project works from now until September to clean, repair and improve the street and help local business. BLOOR NIGHTLIGHT invites the city to witness the start-up of the vitalization of Bloor. Streetlight Sculptures “ Curated by Orest Tataryn with works by by Lois Andison, Matthew Birch, Anne O’Callghan, Gordon Hicks, Thrush Holmes, Heather Nicol, Jonathan Sabine, Orest Tataryn, Christy Thompson, John Wilcox. Overhead sculptures are exhibited fixed to city streetlight poles creating a street-long exhibition of contemporary light art. 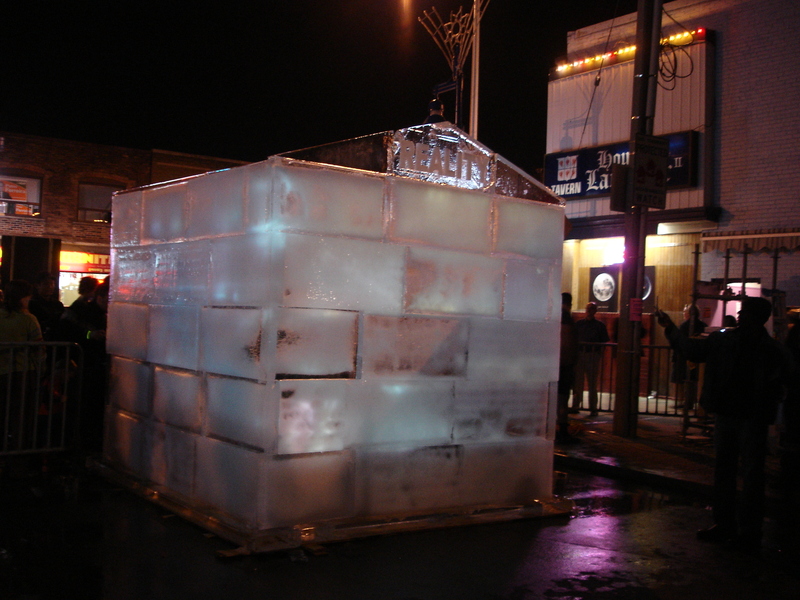 Joe Fleming Ice House and Film Imagery shine through the walls of Joe Fleming eco house made entirely with ice. Light House Art transforms the House Of Lancaster and surrounding area at 1215 Bloor Street West. No Bad Art Poster project by Miklos Legrady. HOUSE Videos by CCCA, Roman Milo, Dougal Bichan, DMP and others. Performance and stage events with ArtTV. Eldon Garnet stainless steel text installation. Ian Worling glass works and much more. Cloud of Doubt Objects and lights sources wrapped in place along the street to create lingering clouds by JP King and Stephen Marie-Rhodes. Bloor Bike Light A bike parade, tricked out in light for the night, curated and bike by Bruce Ward with Mark Greenhough, Herb VandenDool, and others. Stores and Upper Floor Windows along Bloor Local residents and businesses are invited to inventively light-up their store and apartment widows. Water Tower Local water tower landmark project by Roman Milo. Roman lights up the tower, viewable across the TTC lands and has an accompanying film at the Lancaster. 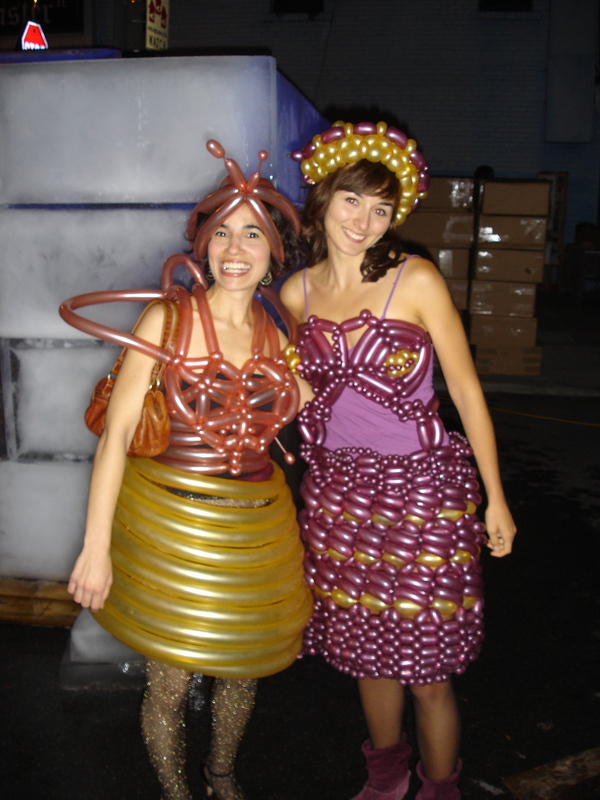 Vine People Half human, half vine, Dyan Marie‘s Vine People are ambassadors for green action, some say super-heroes, others trouble makers. Installed where needed for Bloor NIGHTLIGHT. Carla Garnet Project Illuminated drawing and sound performances with turn tables and overhead projector with John Abrams, Sandra Brewster, Andy Fabo, Cynthia Foo, Mike Hansen, Katharine Harvey, Janet Jones, Sholem Krishtalka, Srimoyee Mitra, Kate Monroe, Natalie Olanick, Frank Perna, Adrienne Trent and Lorne Wagman. Front window DVD projections by: Jesse Bollon, James Gillespie and Yvonne Singer. Thank you to participating artists, sponsors and volunteers. Thank you to the City of Toronto for sending a special bus to Bloordale, to Mayor David Miller for announcing Bloor Nightlight as “not to be missed” to Eye Magazine’s David Balzer for the kind feature story, to Spiro for letting us use The House – all working to help make the night shift. Food +++++ music and events to participate in.